You are currently browsing articles tagged Richmond. The jerky girls at Mei Jan Hong in the Aberdeen Centre. Photo by David Lansing. When I was a kid growing up in Oregon my dad would make venison jerky. It was as tough as it was salty. We’d take it with us when we went fishing since a slab would last you all day. It was like gnawing on shoe leather. Yesterday I was walking through the Aberdeen Centre and my nose led me to Mei Jan Hong, a Singapore-style jerky joint. If you’ve ever had Singapore-style jerky you know it compares to the sort jerky sold in convenience stores that way a baguette compares to Wonder bread. In Malaysia it’s called bak kwa and you can get it everywhere. In Malaysia and Singapore bak kwa is usually made from beef, pork, or mutton. 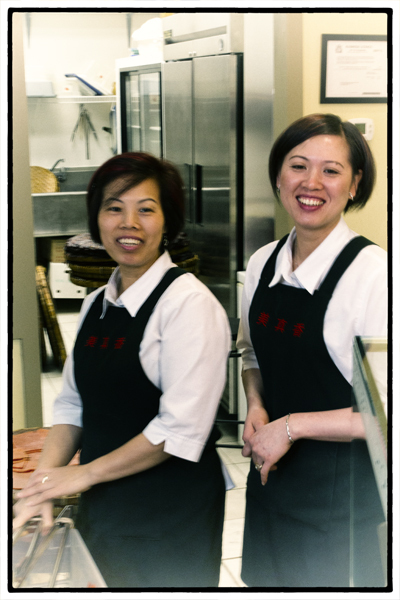 At Mei Jan Hong, they make beef and pork as well as chicken or salmon. No mutton. Usually there are two types of Singapore-style jerky: One is made from very thin slices of a whole cut of pork or beef; the other is made from scraps that are pressed and made into bricks. Jerky made from whole cuts of meat are generally leaner than the bricks of meat, but the bricks are easier to slice and work with. Mei Jan Hong uses bricks and slices the meat into squares so it kind of looks like a very thin Wendy’s hamburger (actually, what they most remind me of is these frozen meat patties we used to fry up when we were in high school; they tasted great but god-only-knows what they were made of. Pink slime?). At Mei Jan Hong, they air-dry the squares of meat in stainless-steel drying boxes (you can see the guy in the back doing this), then finish them off on the grill so you get this slightly-smoky taste (which was what lured me here in the first place). You pick your meat, then order it either sweet or spicy. I went for one of each of the pork and beef. The winner, hands down, was the sweet pork jerky which, to me, tasted like jerky char siu. Sweet, soft, fragrant and nothing at all like the jerky I remember from my youth. Thank god. It’s Sunday. “Let’s go drink some wine,” Laura says. 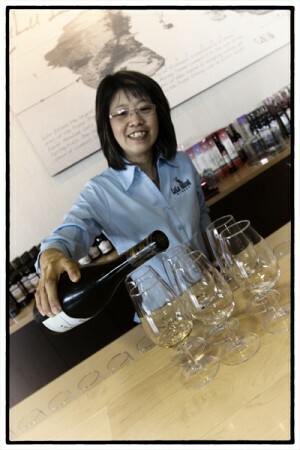 Her friend, Polly, is pouring today out at LuLu Island Winery. Perfect. You know how web sites load particular terms into their sites to attract more attention from Google? Well, if you Google LuLu Island Winery, you’ll see that 8 out of the top 10 search terms have something to do with ice wine. You’ve got Canada ice wine and best ice wine and Vancouver ice wine—well, you get the picture. LuLu is obviously known for their ice wine. Frankly, I’m not a big sweet wine guy. But you know who is? Asians! They love the stuff. And John Chang, who first visited Vancouver from Taiwan twenty years ago, knows that. That’s why he started a winery in 2001 that specialized in fruit wines—blueberry, cranberry, and raspberry wine—and later ice wine. 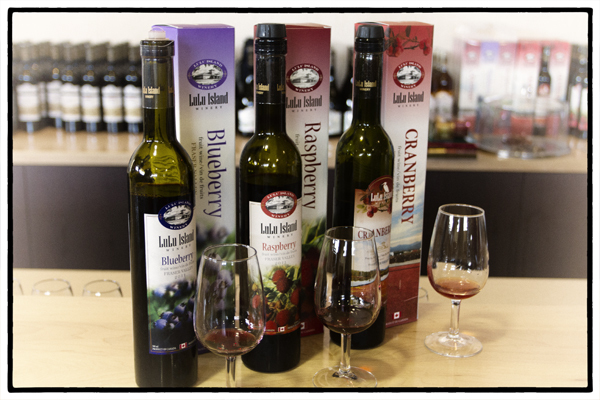 Now LuLu Island is Canada’s largest exporter of wine to China. Polly pours me some red at LuLu Island Winery. Photo by David Lansing. You know who loves ice wine besides the Chinese? Laura! So while Polly was pouring me a mineraly Pinot Gris and a crisp Sauvignon Blanc and a spicy Viognier, Laura was standing in the corner pouting. “Is it time for the ice wine?” she whined. Not yet, I told her. I still hadn’t tasted the reds. “I think I like it,” I said, finishing off the taste. “But I’m not sure.” Polly poured me a bit more while Laura pretended not to notice. When I finished sampling the Meritage, which was really quite delicious, Polly announced quite loudly that it was time for the ice wine. Laura hurried over. “Maybe we should try the fruit wines first,” I said. I started to tell her a story about drinking Boone’s Farm wines in college and why I thought the Green Apple was superior to Wild Raspberry or Strawberry Hill. Which I did. When I’d finished with LuLu’s Cranberry wine, Polly started bringing out the ice wines. She had several bottles. Just before I got to the door, I turned around. “Just kidding,” I told Laura. She acted like I wasn’t even there. “I’ll drink his and mine,” she told Polly. And she did. David and the pineapple buns at the Lido in Richmond. Photo by David Lansing. Saturday morning. Early. Kind of gray out. It’s the middle of August but it looks like it might rain. It’s one of those mornings when you feel like have pastries and coffee in bed while reading the paper. My buddy David Lang, who is from Hong Kong, keeps telling me I need to go to the Lido Restaurant and order a pineapple bun. A pineapple bun with butter—boh loh yaau as they say in Hong Kong. I’m thinking today is the day. So I just throw on some clothes and head up the street to the Lido which is in a crappy-looking stripmall midway between the Aberdeen Mall and Parker Place Mall. It’s barely 8am but the place is packed. No big deal. My plan is to order a couple of pineapple buns to go and eat them back at my hotel with a nice hot latte. It’s David Lang. Sitting in a booth behind the cash register. He’s already got a pineapple bun in front of him. David invites me to join him for breakfast, so what the hell. I tell the boss man that I’ll be having the pineapple buns here. Oh, and could I also have some coffee. “Hong Kong-style?” he asks. David Lang doesn’t wait for me to answer. In Cantonese he tells the boss man to give me Hong Kong-style coffee and to give me two pineapple buns, both with butter. “You got to have butter,” he tells me. About pineapple buns: There’s no pineapple in them. They are called pineapple buns because their crispy tops resemble the texture of a pineapple. They are to Hong Kong what beignets are to New Orleans. And every bit as addicting. About Honk Kong-style coffee: It’s like Nescafe made with sweetened and condensed milk and tastes as awful as it sounds. But after awhile, you get used to that condensed milk taste (I remember nomadically traveling around Spain and Portugal many years ago in a VW camper and not being able to get fresh milk reliably so I’d end up making coffee with Nescafe and condensed milk and damn if I didn’t get so addicted to it that I was drinking it that way when I got home a year later). Now you probably think, like I did, that if you order a pineapple bun with butter that you get a little pat wrapped in foil on the side, or maybe they spread a little margarine over it like you would a piece of toast. But you’d be wrong. They slice the still-warm pineapple bun in half and put a slab of butter in the middle that is about three inches by five inches and maybe half an inch thick. I mean, it’s like half a cube of butter. Real butter. Sweet butter. And damn is it good. 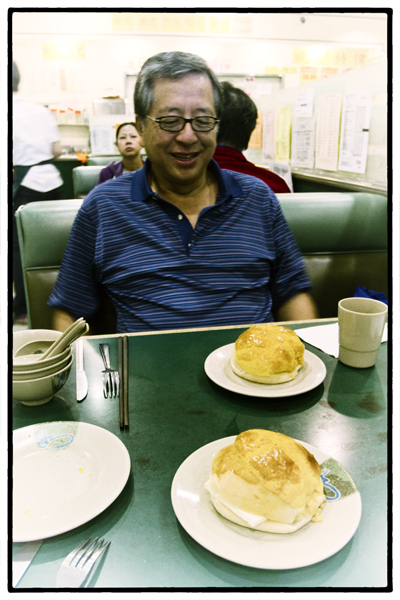 So my two pineapple buns come and then my Hong Kong-style coffee and David has the same, and I’m thinking, We are set for the day. We have got enough here to hold us over until dinner. But I am wrong. For David Lang, this is just the start. This is the appetizer. He’s already ordered a big bowl of macaroni and pork in broth. And congee, which is a nasty looking rice gruel. And a ham omelet. And a Hong Kong donut, which looks kind of like a churro. You know, to go with his two pineapple buns with butter. In short, enough calories to fuel a large family for three or four days. Unless you’re really hungry. Which, evidently, David is. 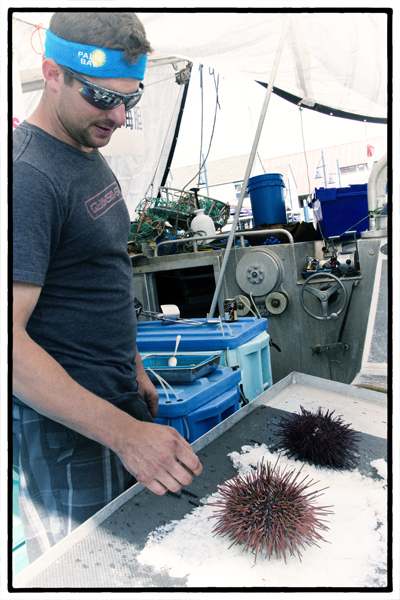 Sea urchins from the Steveston Fisherman's Wharf. Photos by David Lansing. Then there was the couple selling locally-caught shrimp and the salmon fishermen. But my favorite was the guy selling fresh halibut. There was a Russian woman there and she wanted a 14-pound halibut. Why did she want a 14-pound halibut? I have no idea. But the guy pulled a big fish out of an ice bin, weighed it, and told her it was 14.75 pounds. The Russian woman thought about it for awhile and said that was okay. She’d take it. Afterwards, I stopped her and asked her why she wanted exactly 14 pounds. She said she and her husband were hosting a party tomorrow night for her sister who was getting married. And there would be 14 people at the party. “One person, one pound,” she said. And with that she walked off carrying the large halibut over her shoulder. 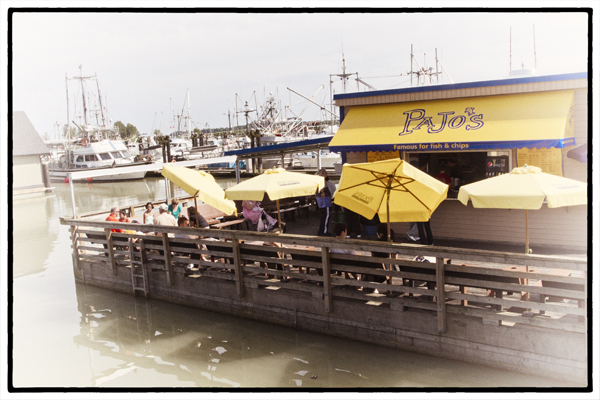 Pajo's on the wharf which some say has the best fish & chips in Steveston. Photos by David Lansing. This was going to make lunch difficult. 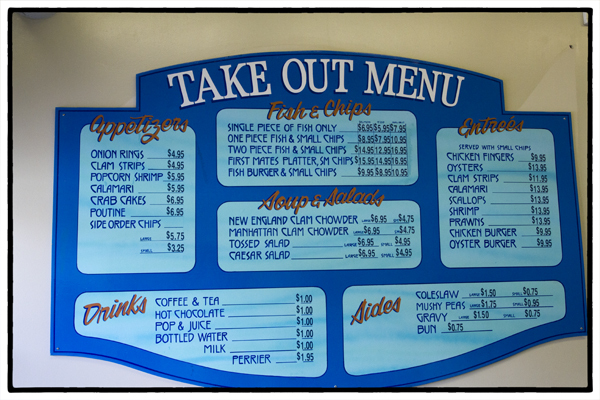 Should I just pick one of the fish & chips joints or try all three? I figured maybe I should check all of them out and then decide. So first I went to Pajo’s. And Mijune was right—the place was jammin’. So much so that it looked like it might be 15 or 20 minutes before I could even order. So Pajo’s was out. Fish & chips at Sockeye City. Photo by David Lansing. Then I went to Sockeye City. Cute place. Right across from the Fisherman’s Wharf. I could eat my fish & chips under an umbrella outside and watch while people bought fresh halibut or shrimp or sea urchins from the fisherman on the dock below. A young couple was doing exactly that so I interrupted their meal and asked them how the fish & chips were. 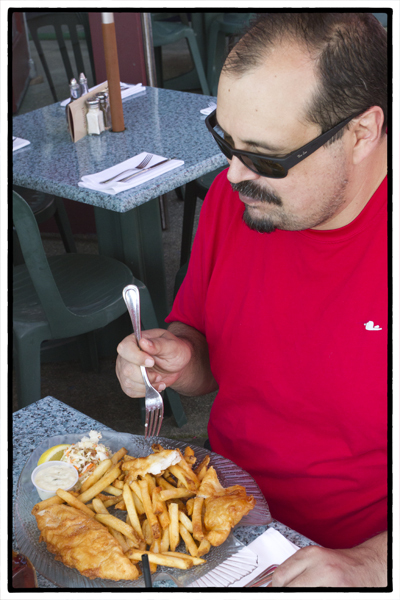 “Really good,” said the guy, his mouth full of flaky halibut. The woman nodded. The portions were huge. They both had three big pieces of fish on their plate and enough fries to feed a family of four. All on a glass plate shaped like a fish. Very nice. Then I wandered down the village a few blocks until I found Dave’s Fish & Chips. Again, very busy. On the side of the building, next to the parking lot, was their takeout window. Besides the fish & chips you could get an oyster burger (never had one of those) and poutine! Now I was overwhelmed with choices. I started thinking that maybe I should just get a single piece of fish at each of the three fish & chip shops and see who had the best. But, to be fair, I’d really have to also give the chips, wouldn’t I? I mean, you can’t decide who has the best fish & chips just eating the fish. But that oyster burger was sounding kind of interesting. And what about the poutine? I haven’t had poutine in ages. Maybe I could just taste the oyster burger and poutine and then check out the fish & chips. 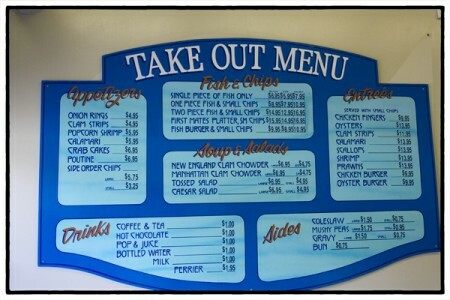 The Take Out board at Dave's. I was standing at the counter trying to figure out what to do when Mijune walked in the door at Dave’s Fish & Chips. So we left Dave’s. And Steveston. And I still don’t know who has the best fish & chips in Richmond.